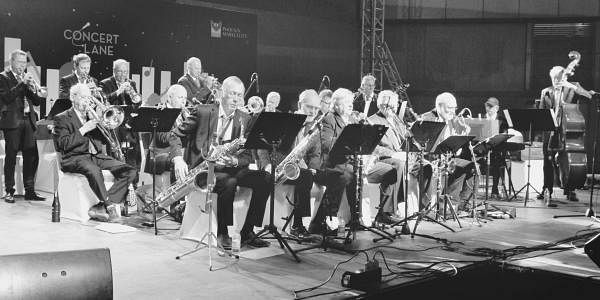 When you first see them play, the Moving Big Band comes across as a strong team of 20 greying happy artistes. More consistent with happy than greying and definitely pleasing with their jazz tunes. BENGALURU:When you first see them play, the Moving Big Band comes across as a strong team of 20 greying happy artistes. More consistent with happy than greying and definitely pleasing with their jazz tunes. Comprising of retired professionals and working men, this band was formed four decades ago. The group initially started off as a band of 16 musicians. “In Sweden, every child that goes to school learns to sing and play an instrument. When the person retires, he or she may take up music again. We wanted to create a platform where people can still pursue their hobby which they left behind,” explains Donald Roberts, the founder of the band. It has mainly Swedish, British and Nordic composers. The jazz band orchestra comprises of saxophones, trumpets, trombones, flutes, clarinet, double bass, piano, guitars and drums. However, the band does not always tour with 20 musicians and hires on requirement basis. One of the pertinent names with the band is retired cardiac surgeon Leif Danvi. The youngest member is 28 years old and the oldest is 55 years old. In Sweden, professional life is much regulated so the team finds time to practise quite often. Donald says that jazz was born out of the need for recreation among the poor. “They would get together in the evening probably in somebody’s house and engage in singing and dancing and that’s how jazz happened. It was started by home-grown musicians in the beginning and gradually people would pay and listen to this sort of music in America,” explains the doctor. The music underwent several reforms later became for refined in the 19th century, says Donald. “It began to catch up with the sophisticated crowd during the 30’s and 40’s. Today, jazz is considered as classical art,” he adds. The band has performed in all Scandinavian countries and covered every venue in Sweden. Their concert music ranges from mellow to high tempo music. Donald, an Indian, says that he is enjoying the Bengaluru climate, especially because it is snowing in Sweden most of the time. “My band mates are happily shopping around in the city,” he laughs. The band enjoyed playing in the city recently at Phoenix Marketcity because the Bengaluru audience is “fun and receptive”, says Donald. The Moving Big Band will be performing at St Joseph’s Boys’ High School on Saturday from 5.30pm to 7pm.